Although last weekend's trip involved a lot of sitting around and waiting, I feel like I've been on the go for two solid weeks. So it's not surprising that after Dude Night on Friday, Saturday seemed perfect for a Day Off. My only obligation during a leisurely morning was to transport drarwenchicken and BILJ to the airport. We got a late start (which would make me Quite Tense, if I was the one flying, but since it wasn't me getting on a plane, I wasn't bothered at all). On the way back home, I stopped at sanguinity and grrlpup's house, to help them take L* for a long walk. One of the things I particularly enjoy about these walks is the far-ranging conversations; this time we covered such things as the social dynamics of gentrification, and Arnold Schwarzenegger movies. Then home for lunch, and out again to see The Librarian. Before we went to Chance of Rain for a very pleasant time with hot beverages and catching up, we drove past the Scary House on SE Taggart (she took a photo). What you can't see is that the yard is devoid of plants, covered with gravel, and surrounded by a short chain-link fence. The many warning signs give the house a pronounced "Bugger Off" vibe. 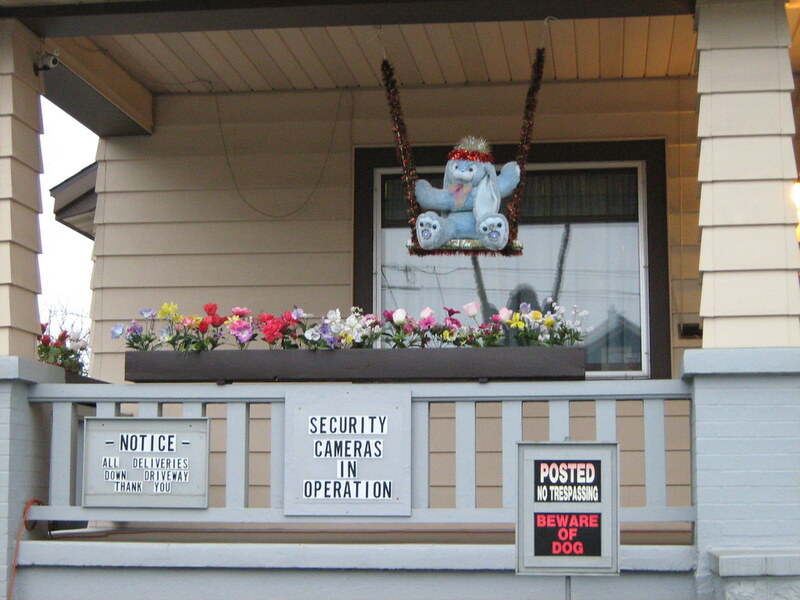 And yet the porch has planter boxes of bright plastic flowers and a plush blue bunny in a toy swing. I guess paranoia doesn't preclude a touch of whimsy. I spent the evening with Mr. Television, watching part 2 of a BBC documentary, called "The Race For Absolute Zero." Fascinating stuff; did you know that Scientists can cool Helium to within a few millionths of a degree above Absolute Zero? At which point it becomes a zero-viscosity superfluid. Amazing. They didn't describe how the experiments have gone Horribly Wrong and threatened to destroy the Earth, but I'm sure they have (or will, very soon**). * 10 miles (that's rounding up to the nearest ten, of course). ** If a substance is cooled all the way to Absolute Zero, it will freeze whatever's touching it down to Absolute Zero, and whatever's touching that, etc., etc., until everything in the world is frozen. Or something like that.